Nasal congestion due to allergies is a condition when the body reacts to allergic triggers (allergens). Many consider this condition to be a symptom of a common cold due to a virus. As a result, the condition of nasal congestion due to allergies is not handled properly. Colds are often caused by a viral infection that attacks the upper respiratory tract. When an infection occurs, the immune system will try to fight. This response then causes symptoms of nasal congestion. Whereas in allergic colds, blockages in the nose are caused by the body's immune system which gives excessive reactions to allergens, such as dust or animal hair. The virus that causes colds will develop faster during the rainy season. Symptoms of runny nose or runny nose usually appear only a few days after being infected by this virus. 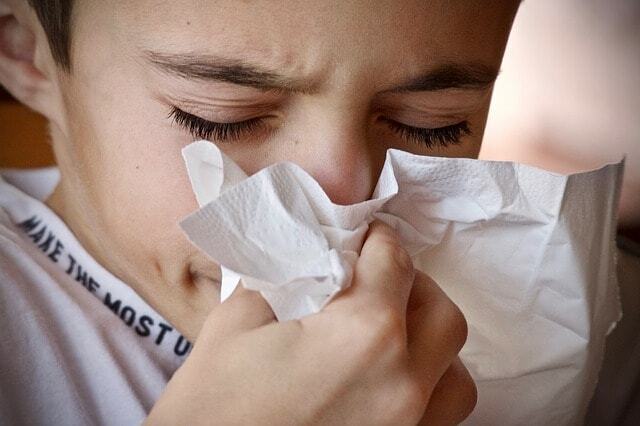 While colds caused by allergies can immediately occur after the body is exposed to allergens. In addition to nasal congestion, other symptoms that appear in allergic colds are runny nose, sneezing, and itchy or runny eyes. Colds due to viruses generally last for 3 to 14 days. While colds due to allergies will last longer, even weeks. Especially if you continue to be exposed to allergic triggers. When you are infected with a virus that causes a cold, your body temperature will increase as the body responds to fighting the virus, so there is a fever. In contrast to allergic colds, which are generally not accompanied by fever. When you experience a cold due to a virus, the mucus that comes out of the nose will usually be yellowish or greenish in color. In contrast to allergic runny nose, the mucus is colorless or clear. Because the causes are different, the nasal congestion due to viruses and allergies also needs to be handled differently. For colds caused by a viral infection, the treatment is enough to multiply drinking water, getting enough rest, and gargling with salt water. In addition, nasal spray drugs containing oxymetazoline can also relieve symptoms of nasal congestion in this condition. Avoid using antibiotics to treat colds due to viral infections, because antibiotics are only given to treat diseases caused by bacterial infections. While in cases of colds due to allergies, you are encouraged to avoid exposure to the trigger, for example by using a mask, or routinely cleaning the house from dust and dirt. The treatment given is only intended to relieve symptoms due to allergic reactions. You can use an oxymetazoline nasal spray to help relieve a blocked nose in a short time. This drug works by constricting the blood vessels in the nose which swell and block the nose due to an allergic reaction. The goal is that you can breathe again with relief. In more severe conditions, oxymetazoline nasal spray drugs may need to be combined with topical corticosteroid drugs, usually in the form of nasal drops. Topical corticosteroids are useful for relieving inflammation that occurs in the nasal passages due to allergens. A combination of both will eliminate allergies quickly. Because the cause of a cold is not necessarily a normal viral infection, you are advised to consult with a doctor so that it can be examined and given appropriate treatment, especially if the complaint does not improve, or continues to recur and feels increasingly disturbing.